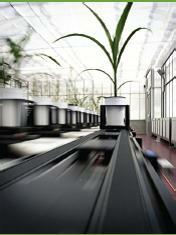 The Plant Accelerator, headquarters of the Australian Plant Phenomics Facility, offers state-of-the-art plant growth environments and the latest technology in high-throughput plant imaging for the repeated measurement of the physical attributes (phenotype) of plants automatically and non-destructively. Strategically located at the University of Adelaide's Waite Campus in South Australia, The Plant Accelerator provides facility users with access to a critical mass of expertise in plant and soil science including plant biotechnology, cereal breeding and sustainable management. We have in place a dedicated, cross-disciplinary team of experts focussed on providing high quality customer service and support. 1Depending on the species and project, and subject to pilot experiment validation, these traits can include colour (greenness), the extent of pathogenic or toxicity symptoms, and morphological features such as leafiness or compactness. 2All images are stored and can be reanalysed later, as new research questions arise or advances occur in image analysis technology. Since opening its doors in 2010, The Plant Accelerator has provided phenotyping services to public and commercial researchers from around the globe. Examples of the projects at our facility include drought tolerance in wheat and tomato, salinity tolerance of transgenic barley and rice, water use efficiency of chickpea, nutrient use efficiency in sorghum, and responses to chemical treatments, just to name a few. 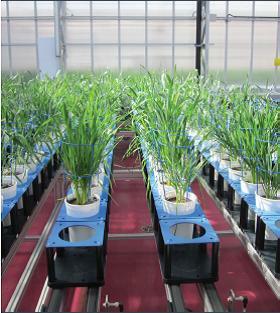 High throughput, high accuracy: The Plant Accelerator can measure multiple phenotypic traits on more than one thousand plants each day. Subtle changes, often not visible to the human eye, can be identified and quantified. Objective and specific measurements: Automated image-based analysis removes the potential for investigator bias. Statistical power of experiments is improved by the accurate quantification of traits which, with other platforms, may be limited to qualitative or semi-quantitative assays only1. Repeated measurements over time: Non-destructive technologies allow repeated measuring of the same plants every one to two days, making the study of dynamic phenotypes simple and efficient. In contrast, other measures of plant growth typically rely on a single destructive assay, from which inferences about growth are made. Specifically designed for crop species: The Plant Accelerator was custom-built to carry out research in cereals, and is well suited to many other species of crop plants. Our experienced team is always willing to establish and validate the conditions required for new species. 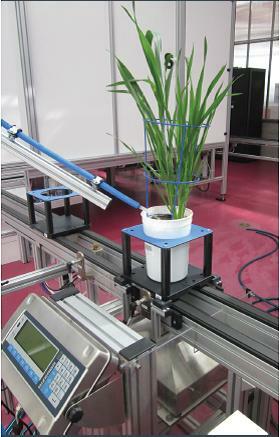 Regulated application of water and nutrients: Plants can be automatically watered to weight to maintain consistent soil water levels. Nutrients or other supplements can be applied according to a programmed regime. Imaging beyond visible wavelengths: In addition to visible light (RGB) imaging, The Plant Accelerator can measure steady-state chlorophyll fluorescence and is developing capabilities in infrared imaging. No preconceived phenotypes: A wide range of phenotypes are routinely measured for every plant, greatly increasing the likelihood of identifying novel genetic or environmental effects. Additional image analysis for specific phenotypes can be carried out as needed by each individual project2. Who should use the Accelerator? Crop scientists: The Plant Accelerator offers great potential to crop scientists, with the opportunity to study in detail the dynamic response of different varieties to a range of abiotic and biotic stresses. Projects already completed have looked at drought response, salt tolerance, nitrogen use efficiency and effects of Rhizobium inoculation. Further treatments that could be tested include waterlogging, harmful mineral stress, other microbial symbionts and certain pathogens. Plant geneticists: Realisation of the full value of the ever-growing selection and depth of plant genomics resources necessitates the screening of many plants for a broad range of phenotypes, including dynamic responses. The large-scale forward- and reverse-genetic screens and association studies required for these types of projects are not viable without the high levels of automation available at The Plant Accelerator. Biotechnologists and biochemists: Although several major agricultural biotechnology companies have installed phenomics platforms, The Plant Accelerator is one of very few publicly-available centres in the world to provide comparable resources. 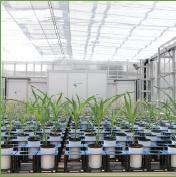 Extensive containment facilities for GM plants allow high throughput screening of transgenic populations for specific or novel phenotypes. 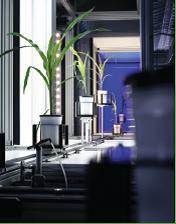 The Accelerator also provides the capacity for detailed study of plant growth responses to certain chemical treatments. Soil scientists: The Plant Accelerator provides an ideal platform to study the effects of different soil types and soil characteristics on plant growth, with potential research applications ranging from improved soil management practices to new phytoremediation approaches. Domestic and international researchers: We welcome researchers to visit The Plant Accelerator and to actively participate in carrying out the work of their projects. We recognise that this is not always possible though, so the Accelerator also offers full service undertaking projects for those researchers who would like to use our resources but are unable to be present in person. We have a range of quarantine facilities to carry out projects with imported material, and are able to assist with import permits and other paperwork. Academic and commercial researchers: The Plant Accelerator is able to carry out projects under both fee-for-service and collaborative agreements. Commercial projects are operated under full confidentiality, while our data portal and other publication resources can assist publicly-funded researchers in making their results freely available. For fee-for-service projects, all IP remains owned by our customers. Intellectual Property generated during the use of our facility remains the property of our customers. We look forward to discussing the ways in which The Plant Accelerator can enhance your research and/or accelerate your commercial objective.